At TJonesWEB.com our focus is website design and development for small businesses and individuals. We will work with you to achieve the aesthetic and functionality that are so important to a credible web presence. From pre-planning to the launch of your new website, our team of talented designers and programmers will be by your side helping to guide you through the process. Depending on your needs we can develop: a site that showcases your services, an ecommerce solution for selling products online, a content management system (CMS) that allows you to update your own content, or a site with any function that your particular business may require. We can also assist with content development including: copy writing (with a focus on internet usability), photography, graphics, motion graphics, animation, and video optimization. Our expertise includes usability issues related to the web and graphical user interfaces as well as accessibility options for individuals who are differently abled. Please take a moment and view our web design portfolio to see samples of some sites developed by our award winning design team. A strong brand image is one of the keys to any successful business enterprise and should be carried through from web design to print and collaterol material. If you are a new business we can develop your brand image including company name, logo design, tagline, tone, and brand colors. If your brand has been established but is not capturing your target market, TJonesWEB can help to reposition your companies identity in order to better reach your intended audience. Usability, as always, is one of our main interests. Therefore we insure that the logo design: will work equally well for digital or print media, will read well in color or black and white, and will function at any size from letterhead to billboard. To see a variety of logos, that have been created by us, please check out the logo design section of the TJonesWEB portfolio. 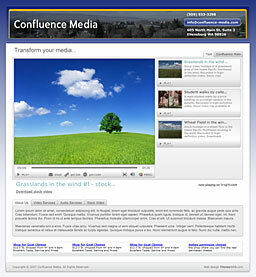 As the speeds of internet connectivity have increased video and multimedia applications have become an important source of web content. TJonesWEB can optimize and embed video in a number of formats including: Windows Media Video, QuickTime, and Flash Video as well as calling video content from sites such as YouTube and Vimeo. Our team includes experienced Flash developers who can enhance the user experience by incorporating motion graphics and animations that both inform and entertain. For examples of our Flash work please see the Flash animation section of our portfolio. We can also use the interconnected nature of the internet to call content and features from sources external to your site. And we can set up syndicated features such as RSS feeds.